Thursday opened with the crew carefully aligning and securing the roof trusses. As our house is being built in a Florida coastal town, a lot of extra hurricane strapping is required to meet stringent codes. Landmark supplied all necessary straps. Pat is securing an already perfectly aligned truss with a special hurricane strap that ties it to the crossbeam of the balcony frame. 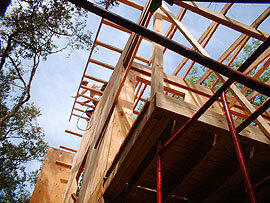 After the trusses were set and secured it was time to build the “outlookers” on the gable ends. If you remember, these support the 2′ roof overhang. 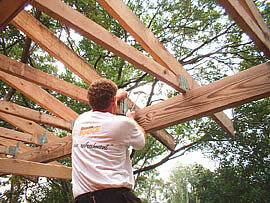 The outlookers consist of 2x4s set in the 1 1/2″ slots previously cut in the top rails and anchored to the next truss over. 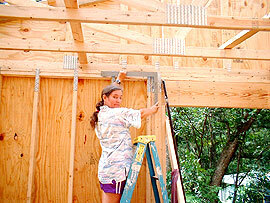 Here Pat is nailing a 2×6 to the outlookers off the west side of the house. This will function as a sub facia board. While most of the crew focused on the roof, Jim decided it was time to fix the internal load-bearing walls to the concrete pad. This entailed drilling 7″ long holes through the bottom rail into the concrete underneath, every 32″, according to the specifications contained in the house blueprints. This allowed the expansion bolts to be sunk into the floor where their special expanding ends can take secure hold. Nuts are then tightened onto each thread to hold the wall in place. 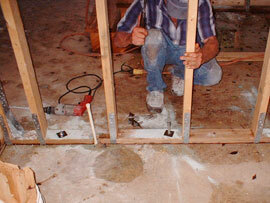 Here Jim is hammering a bolt into the rail and floor. An anchor nut on the left is already tightened down onto the rail. Hollywood and Mick are working here to complete the last piece of facia on the front of the house. After this there’s just a short piece and one outlooker remaining on the right (west) side. Note Elizabeth squatting in the doorway, asking Jim questions while he tidies up the lumber in the house. Our crew were marvelously tidy. Every day they took care to gather all the odd pieces of timber and stuff into one spot for throwing in the garbage. By 3PM the fiddly gable extending is done and we’re ready to sheath the roof with 5/8″ ply tomorrow. Barbie decides it’s time she lent a hand to check if the house is built “square”. 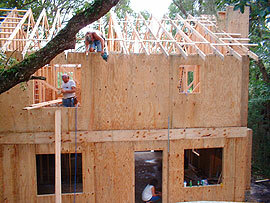 Despite her serious look, it can be seen that the house is indeed upright and level. The framers breath a huge sigh of relief.